On Saturday, 10th March, we took 2 relay swimming teams to the SSSA Primary Schools Relay Championships held at The Spectrum Guildford. 20 schools competed in a freestyle relay and a medley relay. Four Meath Green boys and four Meath Green girls have been training in the brand new Horley swimming pool for the last 3 weeks. On the evening itself the nerves were high. 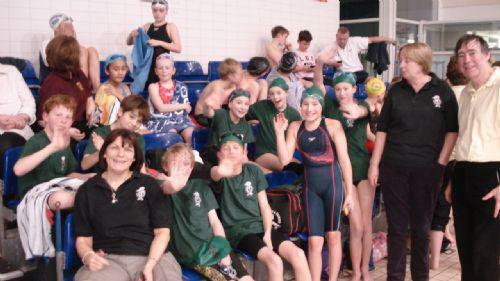 For the first time we wore our new swimming squad t-shirts and Meath Green competition hats. We looked great. After a warm up the real event started. Both teams gave their all and did us really proud!! Mr. & Mrs. Ledwich and Mrs. Flanagan. We hope to repeat this exciting swimming event in the future.